UNP Leader Ranil Wickremesinghe says that he dismisses all the allegations levelled against him by President Maithripala Sirisena. He stated this addressing a conference themed ‘Professionals for Democracy’ yesterday (05). A government should have limitations in exercising its authority and it is not possible to proceed without such limitations, he said. “We want to protect and work in conformity with the Constitution. We do not ask for anything more,” Wickremesinghe further said. President has said that he would not hand over the Premiership to Wickremesinghe even if he has a 225-member majority, the UNP Leader stated. “This is not a problem with me, but a problem with the President,” he said. 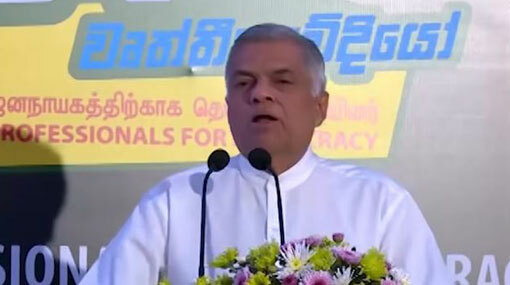 Wickremesinghe further said that the executive powers of the President should be limited and that they had commenced this journey to abolish the executive presidency. Quoting from Buddha’s teachings to conclude his speech, Wickremesinghe dismissed the allegations that the President had aimed at him.